Last week I wrote a note describing all the things I love about living in Charleston, West Virginia. That post has been shared on Facebook more than 3,000 times and drove my blog site views to about 2,500 the first day and to around 6,800 the second day after it published. That’s not exactly “viral” but it’s certainly well beyond the number of reader I typically get. People from more than 15 different countries read that post. I got around 30 comments about it. The popularity certainly was not because the writing was anything special. I think it was more a testament to the love West Virginians — those still living here and those who have moved on — have for their home. I got a lot of notes from native West Virginians living all around the country and in other countries who are still pining for the Mountain State. I get that. I was born and raised about 10 miles north of Charleston in Sissonville. After college I lived for a short time in the Lexington, Ky. area and in Ashland Ky. before moving to Charleston two years ago for a job. I’ve never been too far from home, but even from a short distance, I missed it. It’s a difficult thing to decide whether or not to leave home. Most often it’s not really a choice — people leave because they can’t find work or the right type of work here. It’s not a secret that West Virginia has a brain drain problem. I’ve seen it first hand. Several of my native West Virginia friends have left the state for bigger cities and better opportunities over the last year. I don’t blame them for that. As I said, I don’t know where life will lead me. One day my letter to this place could have a break-up theme. But West Virginia is part of me. I’m not sure exactly what it is about this place that gets into your blood. Sure, the mountains are beautiful and just about everyone loves their home, but I think it goes deeper than that. I think it has something to do with understanding and loving a place that, from the outside, seems so destitute. I think our affection for this place is a defiance of the worst-of lists and stereotypes they try to attach to us. On the other hand, there are reasons for West Virginia to be on some of those lists. It’s a complicated relationship, for sure. But most relationships are, aren’t they? 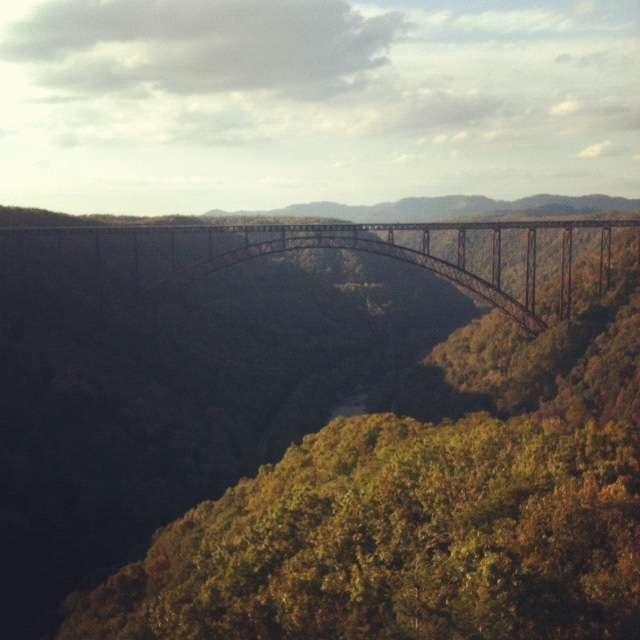 A view of the New River Gorge Bridge, Fayetteville, It’s one of my favorite things in West Virginia. I’m a West Virginia native myself. But I disagree with you on your characterization of why most people who leave West Virginia do so, especially when young. I was born in Charleston and grew up in a community not far from there. Like many young people who grow up anywhere in a small town, I could not wait to graduate and leave. I went to college in Columbus, Grad School in DC and have worked on the West Coast for years. Why did I not go back to West Virginia? Cultural reasons – social reasons. I wanted to be around well educated well, travelled people. At 24 I wanted to be in a hip and thriving community. I wanted to be around young 20-somethings who had interests and experiences in common with me. I have thrived out here on the West Coast and consider it to be my true home. I still have parents in West Virginia and I visit them 2 or 3 times a year, and I m not ashamed of coming from a small town in Appalachia. But I do not limit my options in life by making some sort of fetish about my hometown or home state. West Virginia’s biggest real world problem is a culture of under-achievement. Less than 18% of West Virginia residents have a college degree. In the little town I grew up in, studying in school, wanting to go to college, was considered unusual. The usual was to spend your high school years hanging around the riverfront, drinking beer (illegally) and expecting to live within 3 miles of mom & dad and all your high school buddies all your life. I’m not saying that is a bad choice for some people, but there are those of us with higher ambitions. So. I’ll never live in West Virginia again, but have fond memories of my childhood there. Don’t paint me with the same brush you painted yourself. I left for reasons other than just to find a job.